Write_On 2018 Kits & Party Packs are Here! Finally, the moment you’ve been waiting for, our 2018 Write_On kits and party packs are here! Take a peek at this year’s designs and exclusive Write_On products to aid in your 30 day writing challenge, and head to the shop to stock up before we sell out of our extremely limited quantities! Gear up for 30 days of letter writing with one of our limited edition 2018 Letter Writer Kits! Including 6 cards and envelopes, stickers, a gel pen, and a letter-writing log sheet, these kits are the perfect way to kick off the challenge. As Write_On has grown, we’ve been inspired by the outpouring of support and interest from letter writers near and far. In an effort to make this program accessible to as many people as possible, this year, with every kit purchased in the Write_On shop, you’re making it possible for us to donate a kit to someone in need, including educational and under-resourced community programs. Thank you for paying it forward and helping to keep the art of handwritten correspondence alive in our communities! The Letter Writer Party Packs are perfect for shops, individuals, and organizations alike, and are packed with useful letter-writing tools, tips, and inspiration to host a Write_On party for 10, plus a few extra gifts that you can enjoy for yourself as the host, or use as party favors. For the crafters, creators, and makers, this DIY Party Pack has everything you need to host a letter-writing get together for 10 to kick off the Write_On Challenge. 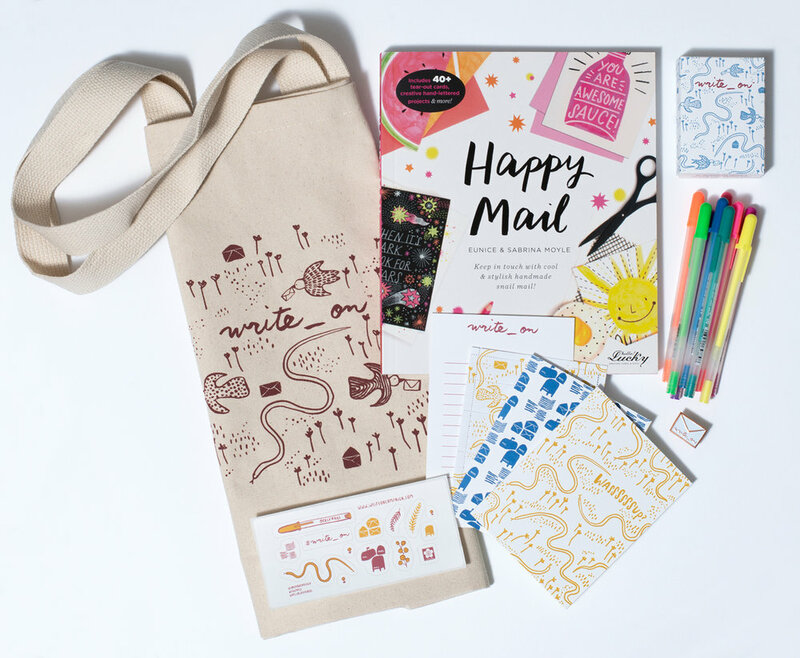 These packs come with a copy of Happy Mail from Hello!Lucky, an assortment of colorful Gelly Roll Moonlight pens, decorative stamps from The Portland Stamp Company, and supplies to get your mail art creativity flowing. This year, we created a custom Write_On deck of cards, featuring 30 different writing prompts to keep you inspired and motivated throughout the 30 day challenge. Printed on Strathmore Impress Wove Pure Cotton, Light Gray 118C, by Mohawk. Hand screen printed by Egg Press in Portland, Oregon with elements from our 2018 design, this large tote is perfect for hauling your letter-writing supplies, packages, or simply to show your Write_On pride around town. This tote is also featured in the DIY Party Pack. Follow along as we share campaign updates online using #Write_On, and visit our new Write_On Facebook group to join the conversation with your fellow letter writers. Write_On would not be possible without the generous support from our amazing partners and sponsors, Hello!Lucky, Sakura of America, and Mohawk Papers!